Gaining Weight. And That’s a Good Thing. Don’t you worry, this post is not about me. Luckily I haven’t gained any weight lately. Should it happen, I wouldn’t necessarily consider that a good thing. This is all about a certain distinguished Pandion haliaetus, namely Papa Osprey. The other day I realized he might have gained a little bit of weight. No, I couldn’t get him to step on the scale, that’s still very much work in progress, but found this picture. 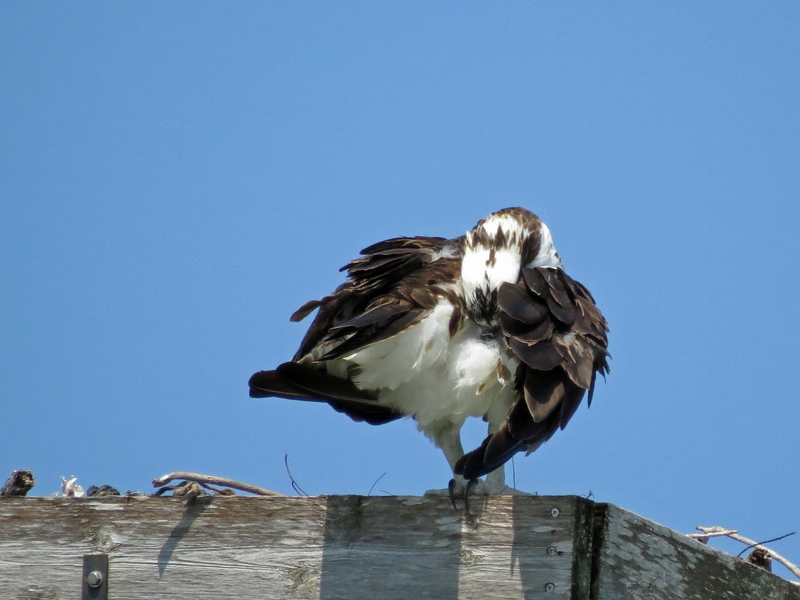 It was taken just after the nesting season in early July, when Papa Osprey returned from his two-week vacation. Doesn’t he look pretty thin and worn out? Just bones and skin beneath the feathers? 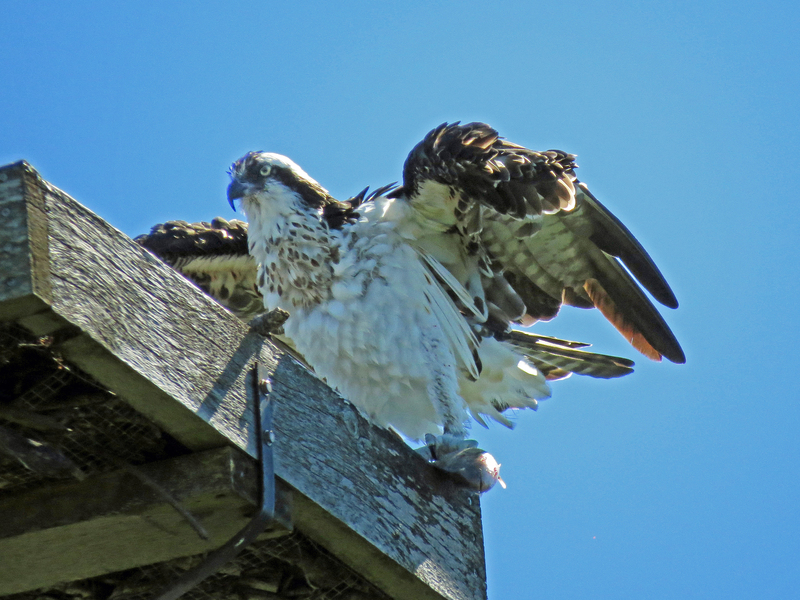 PO in early July, just two weeks after the fledgling left the nest. If we compare this picture to how he looks now, in November, when perched on the edge of his nest with a nice variety of brunch items, I’m sure you agree that there’s some more of him now. …and a fourth variety, a huge one for breakfast at sunrise. You see, Ospreys lose weight during the nesting season. 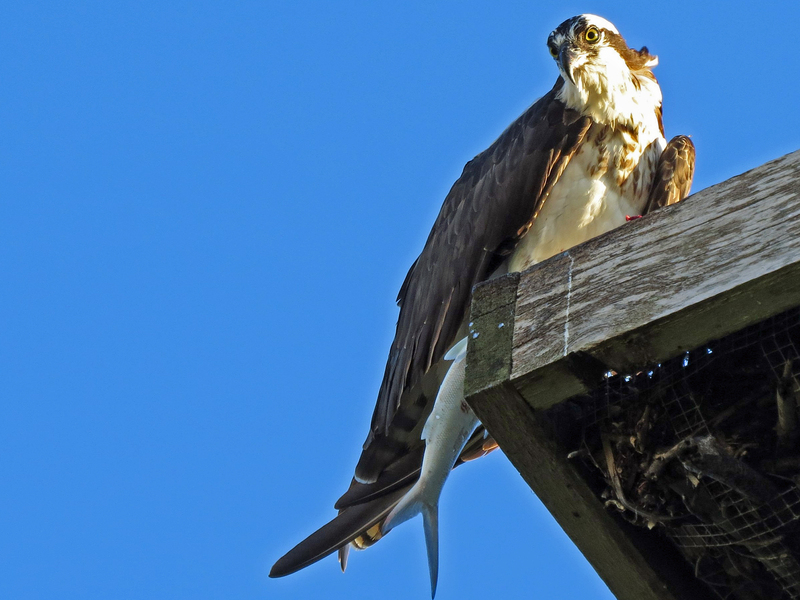 All that hauling of heavy building materials needed for nestoration, and then fishing from sunrise to sunset to feed Mama Osprey and the nestling, made for a good workout. Combine that with the fact that his lunch hour was short, if he didn’t miss it altogether, and the dinner table might have been pretty empty by the time his work was finished , and you have an effective weight loss regimen. 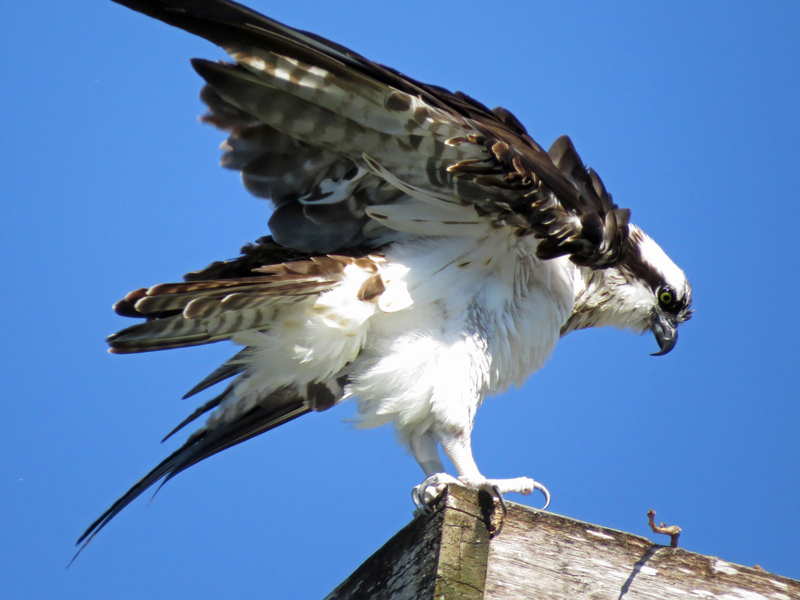 Now Papa Osprey has enjoyed about five months of freedom. Warm, lazy days just gliding along the beach and fishing for himself. No stress. All his attention directed towards his own wellbeing. Full crop most times I’ve seen him. I think it shows. And that’s a good thing. Yesterday I saw he had brought some colorful materials into the nest. He probably wants to make sure Mama Osprey will see the nest from afar whenever she decides to arrive back into this area. It could be any day between now and early January. He’s already preening diligently to look handsome for her. 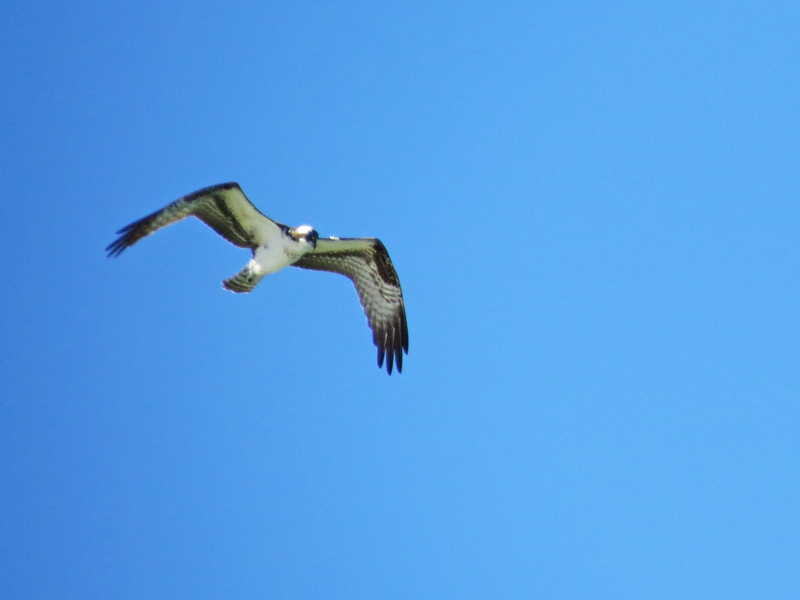 Yesterday I also spotted a new, fourth osprey gliding past my office window, but wasn’t able to make an identification. 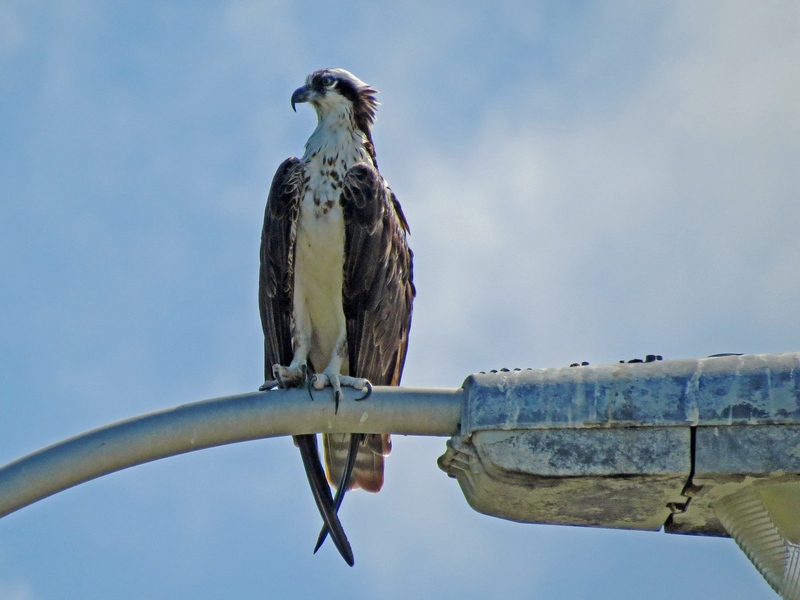 Papa was perched in his nest, and I saw two other ospreys (Stanley and Steve?) 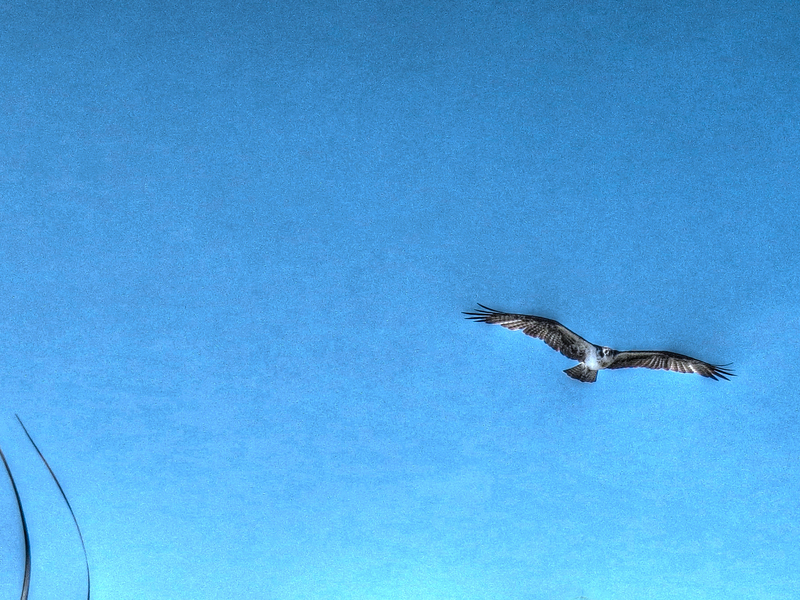 circling above the bay. Might it be Mama Osprey, all rested and fuller figured too, waiting for Papa to perform his Proposal Dance? 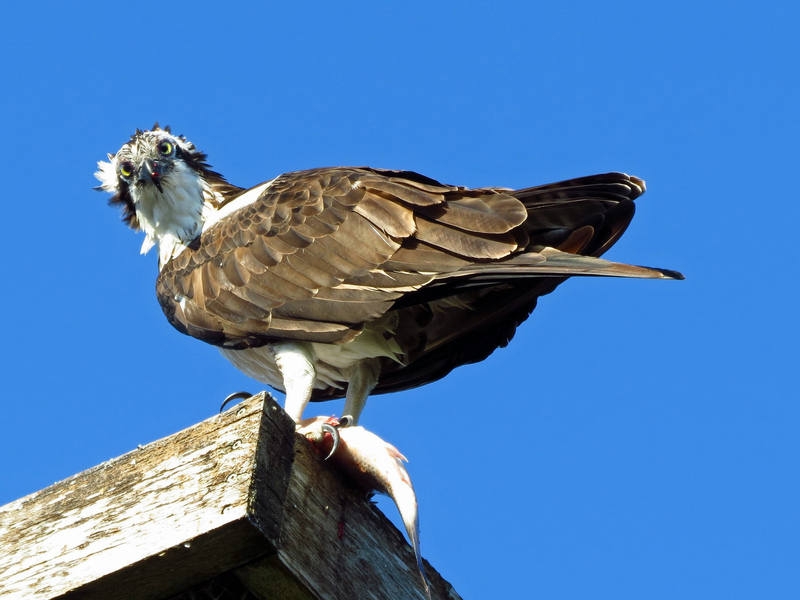 I’m sharing a link to a beautiful two-minute trailer for a documentary about Ospreys. It’s worth watching, and you can do it by clicking right here. It pretty much sums up why Ospreys have a special place in my heart. Hope your weekend has been great so far. Mine has been exceptionally good. 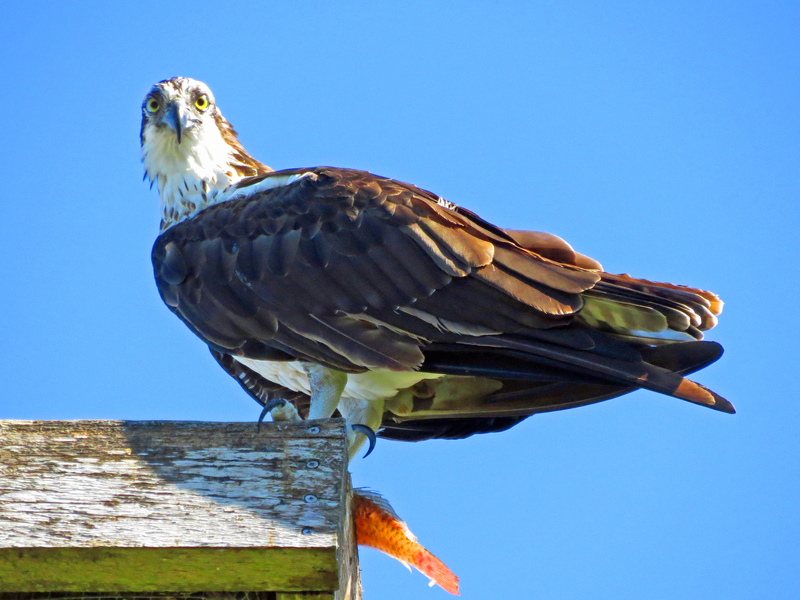 I was able to watch Papa Osprey and the other residents in the salt marsh together with a blogging friend of mine, bird photographer and expert, H.J. aka Avian 101, and his beautiful family. I’m sure he’ll post some great photos from the salt marsh and elsewhere after his vacation. Happy Thanksgiving week to everyone. Papa Osprey is looking good. And not a minute too soon, it seems. I’ll watch for updates on his welcome home party for his girl. I wish I’d be so lucky to witness (and capture) the welcome dance! It seems to be quite a spectacular performance from what I’ve learned. Who knows, he may wait for you to be on the set. Such wonderful photos! It is difficult to watch a majestic bird turn skinny. Some Eagles in our area starve and cannot be saved. So fun that you have a bird watching companion – I enjoy Avian 101’s photos! I’m very sorry to hear about the Eagles. It’s difficult to watch and even to learn about it. Adult Ospreys always lose quite a bit of weight during the active season, but most gain it back when on “vacation”. Young one who have not learned to fish for themselves, may starve though, and some die that way during their first year. It was truly fun to have H.J. and his family here! They did a “stopover” to see the area and the birds, but continued this afternoon to their vacation destination further south. Yes, PO is his handsome self! I loved the trailer too, the summary of the footage and the music. Very serene and calming. Hugs! Great observation! Loved the documentary trailer…and the Native music! I have a sharp eye, Cyndi and even livelier imagination 😀 Happy you enjoyed the trailer, the nature, the birds and the music are quite magical. Glad to learn he’s back to fighting weight. Wish I new his secret. 🙂 Enjoyed the video documentary. Thanks for sharing. And Happy Thanksgiving week returned! Oh, I thought you knew all these secrets of healthy life, Eric 😉 Happy you enjoyed the trailer! Thanks dear Mag! I’m hoping Mama Osprey will appear here in the next few weeks, well rested and well fed too 🙂 Hugs!